Tomato Cucumber and Avocado Salad is a quick and easy light and fresh salad that’s perfect for summer! 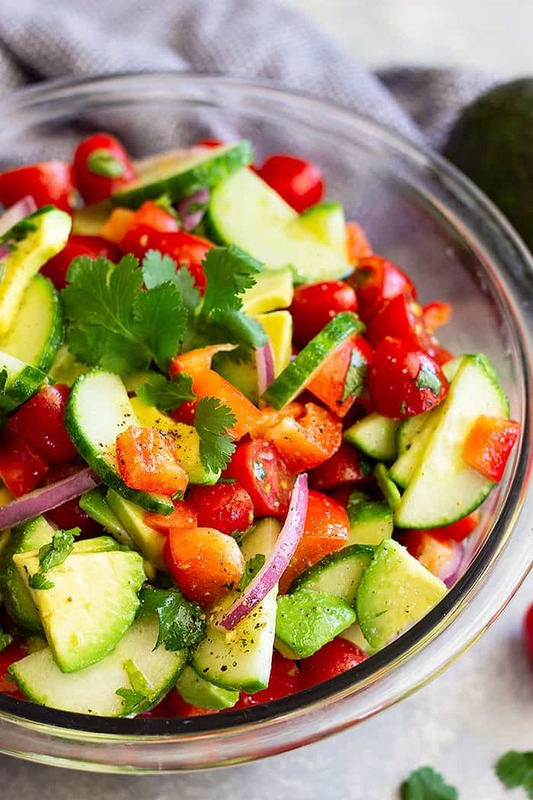 It’s bright, colorful, and healthy to eat! 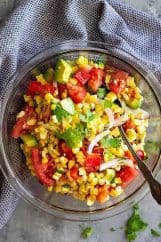 This super light and fresh salad will be perfect for those hot summer days when you don’t want anything too heavy to eat. I love how simple and easy it is to make and I had to fight my kiddos for the last bite! It’s been on the menu quite a bit already and I plan eating it all through the summer as well! 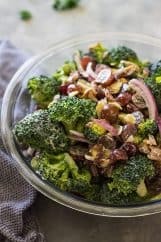 A few other great salads you might enjoy this summer are: Creamy Key Lime Fruit Salad, Homemade Chicken Salad, and Broccoli Bacon and Grape Salad. You know what I just realized??? School is almost out for the year, AAAHHHH and I don’t have anything planned to keep my kids busy!! I knew summer was quickly approaching but somehow forgot that I will have the kids home with me for the WHOLE day. Not only the whole day but EVERYDAY! **Insert mad woman emoji** Better yet insert mad woman with a twitching eye emoji! Don’t get me wrong I love my kids and wouldn’t trade any of it for the world, but just like any normal human, I need my space sometimes too. 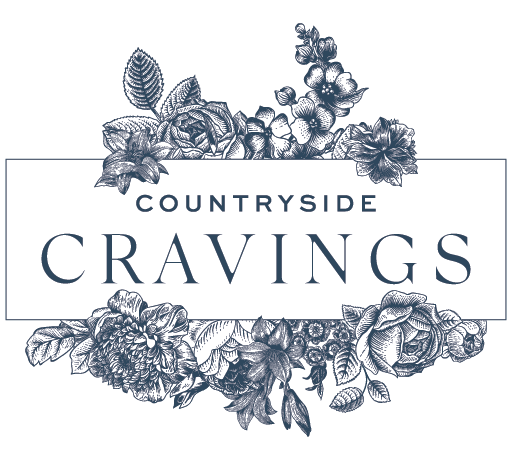 So, with summer hot on my trail and a busy household just around the corner, I will be looking for all the quick and easy meals and sides to pair with them. Also, do you guys still use your slow cooker in the summer? I did last summer along with grilling and it sure helped keep the heat out of the house! Give a gentle squeeze to your avocado and if it’s hard then it’s not ripe yet and it won’t taste good and it’s extremely hard to peel! When you gently squeeze the avocado it should give slightly, anymore and it’s overripe and will be mushy. If you have hard avocados place them in a paper bag with a banana for a couple of days (check them daily) to help them ripen. 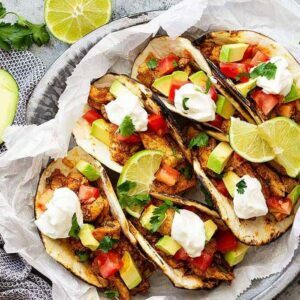 If your avocados are already ripe when you bring them home but won’t be able to use them right away store them in the refrigerator. Add 1/2 of a bell pepper, chopped. The salad in these pictures has a red bell pepper added. 3-4 ounces of feta cheese or 1-2 cups cubed mozzarella. Fresh corn, or even slightly charred corn. 1 (14.5 oz) can chickpeas, drained. Instead of cilantro try parsley, basil, or even dill. Change out the white wine vinegar for red wine vinegar or balsamic vinegar. 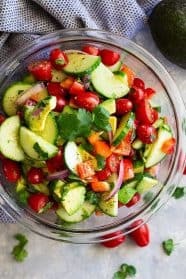 Tomato Cucumber and Avocado Salad -a quick and easy light and fresh salad that's perfect for summer! 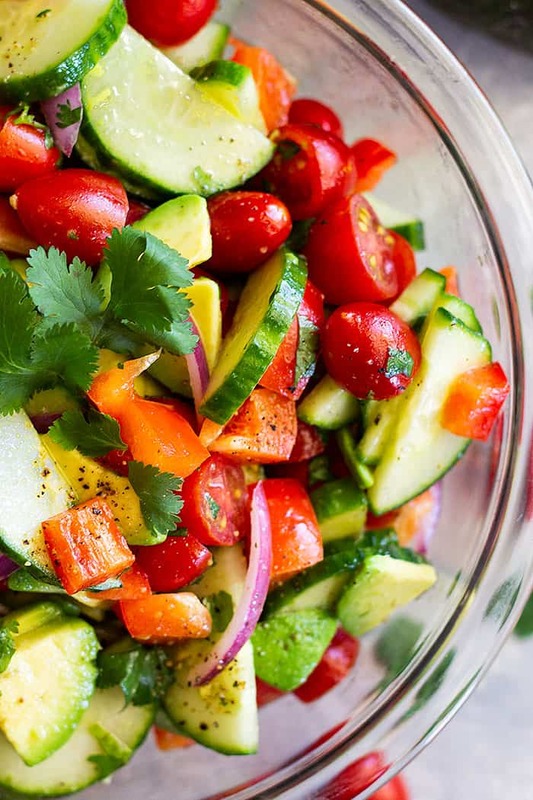 It's bright, colorful, and healthy to eat! 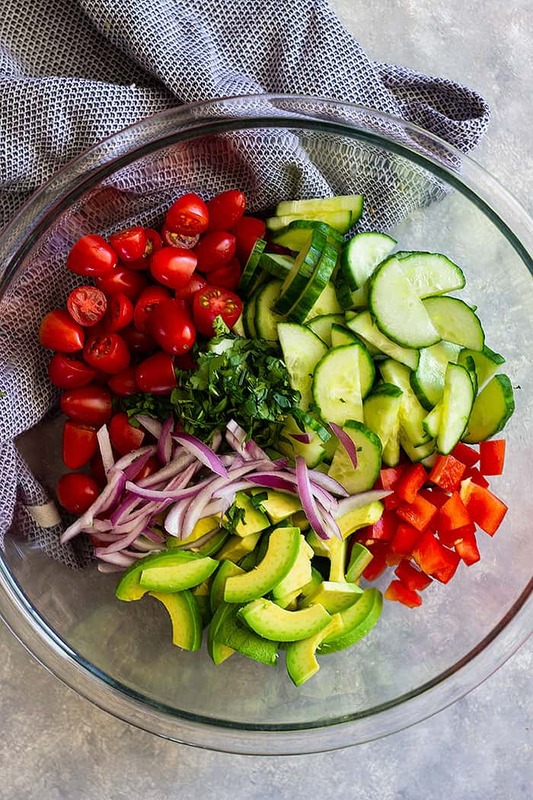 Combine all salad ingredients in a large bowl, set aside. 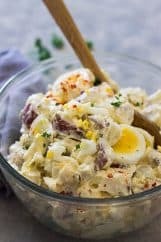 In a small bowl combine the ingredients for the dressing. Drizzle over salad and lightly toss. Serve immediately. You can substitute the english cucumber for a regular one. Just be sure to peel it and if the seeds are large remove them. You can substitute the grape or cherry tomatoes with 1 pound of Roma tomatoes, chopped. 3-4 ounces of feta cheese or 1 cup cubed mozzarella. It’s so bright and beautiful and looks like it would taste simply amazing! It’s so bright!!! It looks so flavorful!! I can’t wait to try it!! This looks so healthy and refreshing! Love it! 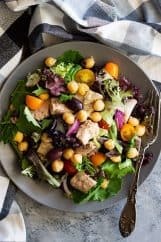 This salad looks so amazing! It screams summer! Thanks for sharing.